have many pistol cases to choose from. The style and design of the Plano Large Soft Pistol Case can appease any tastes and promises more convenience when it comes down to carrying pistols and any extra mag clips. The protective foam inside is created from high density material to ensure shock absorption and add a higher level of protection for weapons and any other tactical accessories. There are three pockets on this case for accessory storage, without overcrowding and risking abrasive damage. 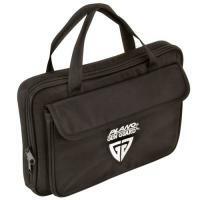 When you're looking for a carrying case that is convenient and simple in design but has no problem ensuring protection and reliability, this is the go to source right here. Plano never lets you down with it's brand products, and you're sure to gain satisfaction when you use this pistol case that comes with speed zipper pulls for faster and easier opening! 9.5" X 14.5" X 2"